At Collision Center Design our focus is the successful application of waterborne and solvent based coatings for the automotive and industrial markets. Increased profitability, energy reduction, and an environmentally sound (green) solution at a reasonable cost is our goal. We strive to create an environment free of contamination, superior atomization, reduced cycle times, and "Quality in the Finish" for our customers. 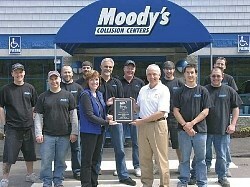 Shawn Moody, 53, was destined from an early age to own not just one body shop, but a chain of them. When he opened his first Moodys Collision in 1977, he was a junior in high school and looking to fix cars in a little three-bay garage. When other kids were playing sports and going to school dances, Moody worked on cars and dreamed about the future. Now his business consists of eight locations that repair approximately 12,000 vehicles annually. Our industrial division is proud to represent Global finishing solutions for your application and process needs. Click on IFS logo to go to GFS site. IFS exceed expectations!